The valet service. Also how close it was to the Fiserv Forum. Unique, historic property. All tower views are amazing, but 23rd floor pool is the best. Seeing a full moon rise over Lake Michigan is unforgettable. Staff was top notch. Cant wait to stay again. The only thing i didn't like was the smoking in the casino. Otherwise it was great. Lovely authentic art deco hotel with original decorative and architectural elements. 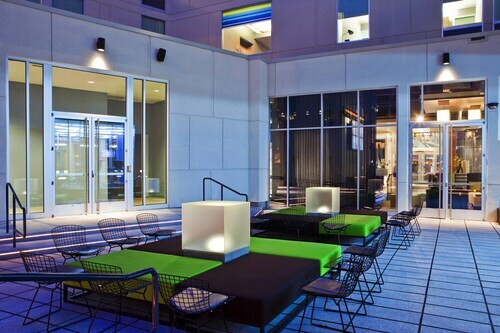 If you're tired of modern chain hotels, this is a refreshing change! The front desk was friendly and efficient. Housekeeping forgot to replace a trash liner, regular coffee and toilet paper. We were there for the Midwest Gaming Classic. They had discount valley service that was cheaper the parking in the city parking lot. Great perk. Convenient and great breakfast!! Shuttle service was great!! Visiting Milwaukee is highly recommended, and with so many great hotels and fun activities to get up to, your Milwaukee trip will be one you will not forget. If you are visiting Milwaukee to relax, you will be happy to hear that the city borders Lake Michigan, and that the Milwaukee RiverWalk is a 3-mile-long trail following the Milwaukee River, where you can gather your thoughts and breathe in the fresh river air. Business travellers can stay in a variety of great business hotels in Milwaukee, to unwind after a busy conference. Also, there are 15 great golf courses in Milwaukee should you have an extra day to spare on your trip. Families heading on a vacation will find that there are plenty of fun family activities in Milwaukee, such as over 130 miles of bike trails. Downtown Milwaukee is one of the best places to stay in Milwaukee. This is where you will be able to take in most of the sights of the city, and it is also where you will find some of the best hotels in Milwaukee. Not only are there some great restaurants to be enjoyed Downtown, but you will also find that Discovery World is there. This is an innovative and fun combination of a science museum, cultural fair, and aquarium, providing fun for the whole family. You will also want to pay a visit to Old World Third Street while in Milwaukee, which is like stepping back in time. Another fun activity to get up to in Downtown Milwaukee is a visit to the Harley-Davidson Museum, which will get your engines running. Amongst the many good hotels in Milwaukee, most are conveniently located near Downtown Milwaukee. However, there are also hotels close to the Milwaukee Theatre as well as hotels close to Miller Park. The latter are perfect for those in town for sportive activities. As mentioned above, there are many great hotels in Milwaukee for you to choose from, in a wide range of prices and comfort levels. There are 65 three star hotels in Milwaukee, all of which are proven budget-friendly options for those wishing to explore Milwaukee. There are also 15 great 4 star hotels in Milwaukee to relax and make the most of your stay in this Wisconsin city. Here, you will be able to treat yourself to a little more comfort and vacation in style. These hotels promise you extra special amenities, such as top-notch room service, in-room coffee makers, and amazing on-site restaurants. General Mitchell International Airport has non-stop flights to over 40 destinations, connecting you easily to some of the best hotels in Milwaukee. If you are looking for hotels near Mitchell Airport, you will find that there is a wide range of them to suit any budget and preference. Great location and two restaurants located on property.